Last month, I had the chance to spend several days in Utah in conjunction with the appearance of The Mormon Jesus. As an author, there’s nothing more gratifying and humbling than getting the chance to talk with readers (and potential readers) about a new book. It’s incredibly fun. 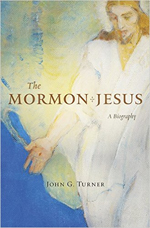 On the 186th anniversary of the formation of the Church of Christ, I spoke about The Mormon Jesus at Benchmark Books. If you are interested in Mormonism and do not live in Utah, visit Benchmark if you ever pass through Salt Lake City. It’s a local treasure, and a treasure trove for Mormon history buffs. At Benchmark, I talked about what led nineteenth-century Mormon leaders to conclude that Jesus had married while on earth. Here’s the video.